If you watched the “press conference” Narendra Modi and Barack Obama addressed on Saturday evening, chances are the same thought went through your mind as mine: what a waste of an opportunity! I mean, how often is it that journalists, especially from India, get to put a question to Modi? Since he became Prime Minister last May, Modi has taken scores of selfies with Indian journalists but not fielded a single question on the record. Not one. In August, he spoke to Japanese journalists on issues of bilateral concern. Last September, he gave an interview to Fareed Zakaria on CNN before his visit to the US, but the interaction had a scripted feel in which an English voice-over took the place of Modi’s own Hindi replies. So starved has the Indian media been of the chance to interview their Prime Minister that it had to settle on the next best thing: talking to Zakaria about what his experience with Modi was like. The CNN anchor didn’t say much but he did reveal that the deal involved very tough negotiations with the Prime Minister’s Office, the details of which he was not at liberty to disclose. When Modi went to Washington, the Indian side refused to allow any questions to be put to him so his “press interaction” with Obama was limited to the two leaders making their own statements. This time around, the US side was insistent that questions be allowed. Reluctantly, the Prime Minister’s Office agreed, on the condition that there be just one question each from the American and Indian media, to be chosen by the White House and Ministry of External Affairs spokesman respectively. The US reporter asked Obama about the Ukraine and Yemen, and then slipped in a question to Modi about climate change. The Prime Minister gave what I consider to be a high-quality answer, the details of which have been reported elsewhere. But the question put to him by the Indian reporter “selected randomly” about the chemistry between the two leaders was such a dud that it was positively embarrassing. To make matters worse, the reporter congratulated Modi and Obama for having had such an excellent meeting! 1. 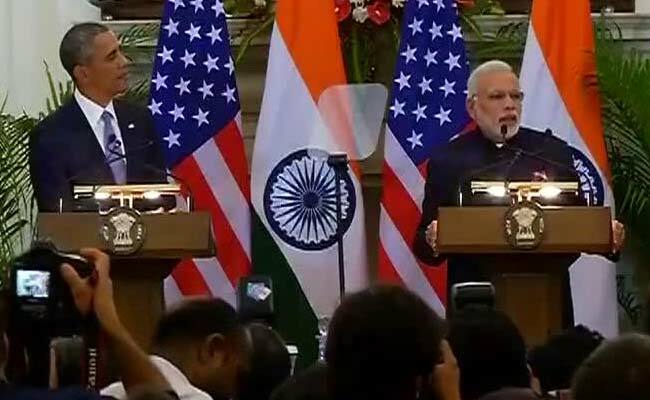 To Modi: Both of you have spoken of a breakthrough in the nuclear deal. Could you tell us what assurances were provided to American companies on the liability front, and whether it’s true that your government told the US that Indian victims of a potential nuclear accident will not be able to sue a US supplier for damages even if the accident is its fault? 2. To Obama: American law allows nuclear operators to pursue damages from their suppliers in the case of an accident, so why has the US government been resisting this provision in Indian law? And when American nuclear suppliers can be sued in US courts by victims of a nuclear accident — a California court had admitted a case against General Electric, brought by US sailors for the Fukushima accident – why are you worried about Indian victims suing American suppliers in an Indian court? 3. To Modi: In 2008, your party had officially described the Indo-US nuclear deal as a sell-out to America and Ms Sushma Swaraj, who was then Leader of the BJP in the Rajya Sabha, told the media that a BJP government would renegotiate the agreement. Now you are saying this same agreement is the “centerpiece of our transformed relationship” with the US. What has made you change your mind? 4. To Obama: You have sanctioned Russia for violating the sovereignty of Ukraine. Why has the US been unwilling to take any punitive measures against Israel for its illegal settlements in the Occupied Palestinian Territories? 5. To Modi: What does the Indian government think about the secession of Crimea from Ukraine and its subsequent absorption into the Russian Federation? 6. To Modi and Obama: Do India and the US agree that the forthcoming Paris agreement on climate change should not be legally binding, and not permit a review of emission targets? And does the US believe the new agreement should distribute the burden of emission reductions based on historical emissions, the principle of Common But Differentiated Responsibilities, and equity? 7. To Obama: The whole world has seen the Senate report on how the CIA tortured prisoners. Isn’t the United States obligated under the Torture Convention ( which it is a party to) and its own domestic laws to prosecute those who committed – and those who ordered -these brutal acts? 8. To Modi: You have said you are proud of your association with the RSS, but ever since you became PM, individuals and organizations connected to the RSS, including MPs from your party, have been saying and doing things which make India’s Muslim and Christian minorities insecure. Do you endorse those activities? If not, why have you never publicly and directly condemned these individuals and organisation for spreading hate and intolerance? 9. To Obama: The US, including your administration, denied Mr. Modi a visa to visit the United States despite the fact that he was an elected Chief Minister of Gujarat, something even the previous government criticised you for. Do you concede you made a mistake? Did you change your mind on the visa issue only because he became PM and you finally realized your boycott would adversely affect bilateral ties? 10. To Modi: Your government has passed several ordinances, including one which amends the Land Acquisition Act and farmers are once again apprehensive about their land being taken away to benefit corporate India’s projects. If there was indeed some urgency involved, why was a draft not circulated soon after you came to power, so that its provisions could at least have been debated in the Lok Sabha and by the general public? This entry was posted on January 27, 2015 by Siddharth Varadarajan in Indian Foreign Policy.